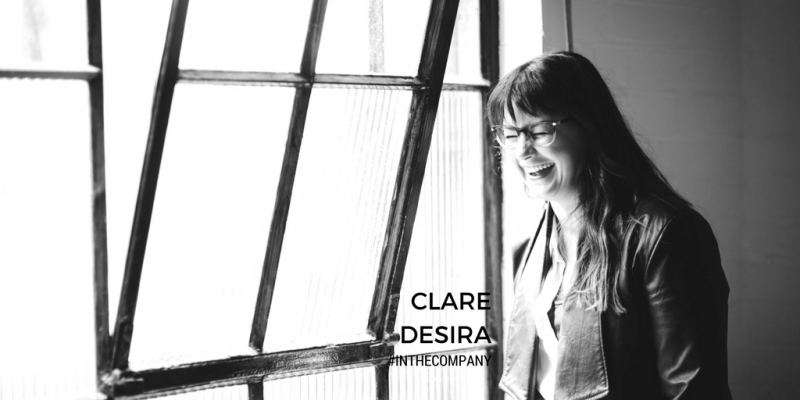 In this podcast episode of In The Company we talk with Clare Desira. Clare is a writer, coach, speaker and founder of the Top Five Movement – her side gig from her full-time corporate role. In December 2006 Clare started a daily practice of journaling her top five moments from the day, and has done so every day since. She now has over 2000 top five lists totalling more than 10,000 memories. The impact of her daily gratitude practice has been so profound that she created the Top Five Movement as a way of encouraging people to foster greater happiness, confidence and energy in their lives. Earlier this year, Clare’s Positive Thought Starter cards won product of the year. Kylie: You’re listening to In The Company, a podcast about humanising work and designing better working lives. Each episode is curated to provoke you to think more deeply about things that matter in your career and life, and how to build your toolkit for how to thrive as a human in business today. We explore how we work from the inside out. I’m Kylie Lewis and it’s great to be in your company. Welcome. Today, we’re in the company of Clare Desira. Clare is a writer, coach, speaker, and founder of the Top Five Movement, her side gig from her full-time corporate role. In December 2006, Clare started a daily practise of journaling her top five moments from the day, and has done so every day since. She now has over 2,000 top five lists, totally more than 10,000 memories. The impact of her daily gratitude practise has been so profound that she created the Top Five Movement as a way of encouraging people to foster greater happiness, confidence, and energy in their lives. Earlier this year, Clare’s Positive Thought Starter Cards won Product of the Year. Kylie: Clare, I’m so excited to speak to you today. We always have a bit of a laugh and a good chat when we get together, but one of the reasons why I was so keen to get you onto the podcast was because, for all the talk of building a daily gratitude practise that’s espoused out in the world, you’re someone that has actually done it, and continues to do it and reap the benefits of it. So I’m very excited to share somebody who has actually walked the talk and done it. But before we get into that, I just wanted to ask you, what did little Clare love doing as a child? Clare: I had great fun as a child. I remember being outside a lot and collecting things, and I grew up in the country and life just felt simple and free. I was a townie. I lived in town, not on a farm. But I pretty much just hung out with the other kids in the neighbourhood and went wherever the fun was, really. Kylie: So did you have any brothers or sisters? Did you like hanging out with mates, with that country freestyle sort of, free range kid roaming kind of thing? Clare: Yeah, exactly. I had a older brother. Two years older. James. And we had some great neighbours. We actually had a playground out the back of our house, so it wasn’t ours, it was like a council playground, and we just spent so much time there playing cricket, or footie, or collecting cards, whatever the last fad was, we were just having the best fun. Clare: Just making it up as we went along. Kylie: So that kind of idea of growing up in the country and life being simple, I know that’s something that has been a thread that has emerged in your work, which we’ll get onto a little bit later. But how, maybe, has your childhood growing up in the country impacted your life in the city now? Clare: Oh, it’s a great question. I really like meeting other country people that are in the city. I feel like there’s this unsaid thing, like when you’re chatting to people and you find out where people are from and you hear that someone’s from maybe a regional country town like yourself, it’s like there’s this unsaid connection. And you’re less involved and aware of, probably, I think some of those unsaid politics around maybe where you grew up in Melbourne, or when you went to school. Like, I’ve got no idea what any of that means when people talk about it or connect in that way, so whilst maybe I’m missing a strong network that some of that seems to bring, I’ve actually loved moving to Melbourne and I’ve been here for a while now, but really starting fresh and being really open to meeting new people and not being … not necessarily bound by those lifelong connections that people have that have grown up in Melbourne, but just, I guess, being a little bit naïve and free to go wherever my heart’s wanted to connect. Kylie: So as an adult now, can I ask you … I’m always curious as to find out from where we were as children to where we find ourselves today in our adult lives. What are three things that you believe in now? Clare: I believe in so much. I think that the best things in life are free and it’s important to keep it simple, as you’ve mentioned. We have more answers than we realise, and it’s always cool to be kind. Kylie: Yes. I absolutely love all of those, and I’m guessing that what informs your work as a coach comes very strongly from those beliefs that you hold. Kylie: So could you tell me a little bit about what the Top Five Movement is? And I guess, as a result, I’ve collected over 10,000 memories from doing that, and it’s absolutely one of the most instrumental ways to increase your happiness, just looking out for those positive moments from every day. They don’t need to be huge, they’re just the small things. The small wins that you have, maybe just making it in time to catch the train, or connecting with somebody, or doing something on your to-do list that had been there for ages that you just hadn’t got around to doing. Just that feeling of achievement. So it’s the tiniest things, and it really … since doing that habit I’ve learnt a lot about gratitude, which is so hot right now, as you mentioned. And also that there’s a big body of evidence that sits behind this way of thinking and actually training your brain to look out for the positive. Anyone can do it. It transcends age and religion, and has so much evidence to back it up, and I’m without a doubt a better woman, sister, daughter, friend, employer, employee, because of this tiny little habit that I squeezed in at the end of my day so many years ago. Kylie: So why do you think this habit’s stuck? Clare: I think I was getting so much positive emotion from it. I wouldn’t have known that at the time, but it meant that my day looked like … it looked completely different, because when my head hit the pillow at the end of the day, I wasn’t worrying about what I hadn’t done. My head hit the pillow having just come off the buzz of writing down some positive reasons to remember that day, and so I’ve got no doubt that I was sleeping better, I was excited about life. Yeah, I was really noticing and appreciating things, and again, it’s so simple. It’s one of those habits that is so simple and easy to understand that people can dismiss it. I think sometimes when we understand how something works, we assume that we’re going to understand how it’s going to actually make us feel, but knowing something and doing it or applying it are completely different. And so I think that’s why it made a difference in. Probably to other people, the impact of it wasn’t as obvious. Probably. But then after a little while people would say things to me like, “You’re always looking on the positive side.” Or, “You’re really quick to see the positive as well.” Because I’d been training my brain to see this, and without realising even at the time, I’ve since learnt that this type of habit can actually transform your brain’s default from the negative to the positive frame, and so unknowingly I have been doing this for years. Yeah, and it’s really paid off. Sometimes you don’t realise how impactful something is until … Sorry, I’ll start that thought again. It’s really paid off. I know that there was one day that it particularly helped our family, this habit, was actually one of our toughest days. So I think it’s easy for people to assume that maybe my life’s sunshine and lollipops, and that’s why every day I’ve been able to find five things, but that’s not actually true. I live a human life and there’s highs and lows, and this one particular day was the day my brother, who is a returned soldier and was suffering from some pretty significant PTSD issues, he tried to take his life. And it was actually on that day, where my mum and dad and I, at the end of the day we sat down, and we were about to go to bed and settle in for probably a really sleepless night, and I said, “We need to remember today for five positive reasons.” And you know what? We came up with some. Even on one of the toughest days in our life. And it was little things like getting to park right outside the hospital. It was the lady at the hotel we were staying in, because we’d had to travel into state to be there for him, letting us having a late checkout with no questions asked. She could see that our family, something was happening, and it was the little things like that that were worth remember that day for positive reasons. Kylie: There can be no more powerful time to be able to call on that kind of practise, undoubtedly. But you had actually started the practise even before that moment arised with your family, so what a powerful gift to be able to offer up in some of the darkest times. Clare: Yeah. I’d started it years before. And so it was my go-to, it was my natural default. And it would be easy for people to not put that habit in place on a tough day. That would be a good reason not to, but it’s actually probably the most important time to draw on those skills. And it’s a mental health routine. People talk about physical health routines a lot. That’s easier to understand, but writing a top five is a really simple and easy mental health routine that any of us can put in place at any time. Clare: Oh, The Happiness Advantage. Kylie: The happiness advantage, that’s right. And he talks about it being a hygiene habit, so just as we brush our teeth every day and take care of cleaning our teeth, we practise a gratitude practise or a happiness practise where we prime our brain, so positivity is a hygiene habit, is a mental hygiene habit to take of. If you like, cleaning our brain. Clare: Yeah. Yeah, it totally is. Kylie: And that touches on some of the research that you mentioned. There is now an ever-increasing body of evidence about the importance of priming ourselves for positivity in the kinds of habits that we can have each day, which you’re obviously living proof of that. Do you have insights as to what some of the more recent evidence is coming out? Clare: Yeah, look, I know that there’s a pretty alarming statistic around mental health in Australia, and it’s likely that 45% of Australians will experience a mental health condition in their lifetime. And that’s diagnosable mental health conditions as well, so it’s not just people feeling a general level of anxiety or stress, it’s actually people that have diagnosed. I wanna change this stat. I wanna be able to share habits, and tools, and tips that people can disrupt those unhelpful thoughts and really support themselves to think differently, and to think more positively. And positive is a word that’s thrown around a lot and people can shut off really quickly, but if you swap it with helpful at any time, instead of think positively, think helpfully, then I think people can understand what the power of this. Kylie: So why did you start the Top Five Movement? Clare: Well, I really wanted to share this habit. For me it was about sharing this habit with the world, but it was so much more. So 14 years ago, I attended my first personal development programme, not really even knowing that that’s what it was. It was branded as a leadership programme and I was a young, keen business student at university and my boss has suggested it, and not being someone to shy away from an opportunity I said, “Of course, I’ll go.” And I went along thinking I’d meet some new people, maybe learn a few things, but my life was never the same again. It was a chance to be out in the fresh air and work with some incredible leaders, and learn the value of space, and self-awareness, and how that can translate into self-esteem, and courage, and confidence and passion. And actually at that week, I learnt what my values were. I must have always known maybe unconsciously, but I discovered that my values were around love, and joy, and family, and making a difference, and productivity, which might sound a bit jarring, but for me, productivity as a value is around how I can have the biggest impact I can. And so those values really started to spur on and guide the decisions that I was making daily. Not long after that I discovered the top five tool, and then a couple of years after that I had the opportunity to become a fellow with the Centre for Sustainability Leaders, and through that experience we had to really craft up, as a leader in the field of sustainability, what we stood for. And so that was a really great opportunity for me to really think about the connection between these happiness and gratitude habits and the vision that I had for the world, and I had the opportunity to really articulate that and started to imagine what the world could actually look like if everybody wrote a top five. This tiny little habit, grabbing your pen and notebook at the end of the day, and reflecting on the positive moments and linking that with the research, and I truly, hand on heart believe that if everybody wrote a top five and focused more on the positive that the world would be a different place. And that people would connect more meaningfully and we would be healthier, physically and mentally, than we ever have been. Small things would make the world go round and there’d be nobody in need, because we would all recognise how much we already have and how much we already have to give others as well. So I guess those experiences coming together really led me to start the Top Five Movement, and the business is now packaged up around simple tools for a happier life. So anything that I create or discover, I share as far and wide as I can so that people can really pick the tools that resonate with them and give them a go. I do a lot of speaking and facilitating with groups from community groups to university schools, businesses, coaching around mindset, confidence and clarity. And also a product that I launched not too long ago, which has now won a Product of the Year award, which is fantastic, and again is just another tool for priming people for positivity or helpful thinking. Kylie: So I think what I find fascinating about this whole area is that we often show up to work, or show up in our families, into situations, sometimes not of our own doing, that aren’t happy, that aren’t easy, that aren’t positive in any way, shape, or form, and this situation with your brother is a prime example of that. And so this isn’t about necessarily saying that we craft this joyously happy life that never has hard moments. What I see you doing is saying when those hard moments arise, having a practise that helps us deal with that, and having a brain that acknowledges that this is a difficult time and that we can also get through it is one of the things, I think, that is a skill that is missing in a lot of professional development programmes. So it’s really interesting to me that this came to you through some work development. Clare: Yes. Yeah, it did. Yeah. Any really development opportunity that I can take on, I really take on. Maybe too many sometimes, because then you can get in that space of collecting so many things and, yeah, there can be like that funnel of having so many things you wanna share, and also I only really like to share things that I’ve had the chance to apply myself, so that you’re kind of walking the talk as well. Try things out and test it too. So it was through a work opportunity. It was also through Rotary, so my boss was a Rotarian, and this was a programme that was run for young people by young people through Rotary. Yeah, that I first attended. Kylie: Yeah. So how would you say that this has shown up for you in your work? Clare: Yeah. So I think top five, and anything from development in coaching as well, is just the mindset that being able to really reframe to the positive, and learning that we only have a certain number of thoughts a day, and it’s actually a huge number. Some research suggest that we have 65,000 thoughts a day, so no wonder we’re tired because that’s a lot of thoughts. A lot of these thoughts are actually unconscious, and for the average person, 65% of those thoughts are actually negative, which is pretty sad when you think about it. But also what was exciting to learn is that 10% of thoughts every day are new thoughts, so we can add in new thoughts every single day, and so I guess what I’ve been doing over these many years is adding in as many helpful and positive thoughts as I possibly can into that new space each day, because that’s then an investment in the thoughts for the next day. So those thoughts go on and repeat again and again and again, because they get caught up in that loop. Now, when you add new thoughts into your mind, or you’re concentrating on those thoughts that you’re maybe aware of, or those unconscious ones, they actually impact directly how you’re feeling, which impacts how you show up in the world as well. So it’s actually really important. And so focusing on the thoughts that you’re having, and trying to make sure that they’re as helpful as they possibly can, or listening to the thoughts that aren’t necessarily helpful and just having a bit of a sense check around, “Is there something I need to learn from this, or is this just a thought that’s coming up out of habit?” Is really important, and impacts everything you do every single day. For me, a couple of years ago I was struggling health-wise, so with work, I actually had been diagnosed with an autoimmune disease and was struggling really for energy. And having been always quite ambitious, and having my goals set on things at work, like a lot of other people, were around maybe getting a promotion or getting a pay rise. I actually worked with a coach and put all of that on pause, and I set a goal around working with love and purpose every day. So it’s a different type of goal. It’s what’s called a feeling-based goal, and it’s the type of goal-setting and coaching that I’m trained in myself, where you work through a six session process with people around really trying to focus on that goal, putting that goal front and centre. So my goal was working with love and purpose every day, and that’s how I really wanted to try and cope and work through that situation. And it sounds fluffy, compared to a goal like getting a promotion or a pay rise, but what it actually looks like every single day was around me thinking, “What are the different ways that I can bring love into my day?” And part of my work then was and still is working in a corporate environment, so throwing that word around, again, might sound really fluffy, but what that actually meant, the instrumental actions that I was taking was being really self-loving, so really looking after myself. Making sure I was resting, I’m eating well, being healthy. Also meant that I was connecting in with my work. So just really actually appreciating, taking a couple of minutes before and after each interaction to really think about what it was that I’d done with that time, and really connect with it rather than just be speeding through a to-do list. Actually be connecting with stakeholders and reflecting on the outcomes of an action that I’d just taken, or an email that I’d taken. Or how I could actually connect with my teammates a little bit more and be that positive force around other people. Working with purpose every day meant being really organised, really effective, really productive, which … is it lines up with my values, and was really motivating for me. So it was around learning new ways to work harder. Sorry, to work smarter, not harder as well. And it really made a difference, and as a result I actually got a pay rise and a promotion anyway, even though they weren’t on the radar, that wasn’t actually the plan, it was tuning into those feelings. It was actually really, really effective and made a huge difference to how I was working. Kylie: That’s so powerful, and it reminded me of Jill Bolte Taylor, the neuroscientist who had a stroke, and she actually, as a patient who was non-verbal, being on the other side of having this really active brain, but wasn’t able to communicate. She was really aware of the kinds of energy people would bring into the room. Of the kind of energy the different nurses would bring into the room while she wasn’t able to communicate with then. And in her book, A Stroke of Insight, she actually really encourages us to be aware of the kind of energy that we bring to the room when we arrive. And it sounds to me like that’s exactly what you were doing when you had set that feeling-based goal of working with love and purpose. It was being really mindful of the fact that you wanted to have that kind of energy within you, and then putting that out into the world. Clare: Yeah, absolutely. And there’s actually some research that’s been done recently by Forbes Magazine around mental health and small business owners, and it’s the idea of emotional contagion, which is a real thing, and it is basically around your emotions being contagious and those strong emotions can have a flow-on effect to other people. And this research has really … not surprising, in a lot of ways, but what it found was that 30% of small businesses were failing based on the mental health of the founders, because the mental health of the founders have such a big impact and flow-on effect to the rest of the business. And so if you’ve got somebody at the top whose mindset isn’t as sharp and as strong as it can be, that’s impacting how they show up every single day, then it’s no wonder that that translates into business results or lack thereof as well. Kylie: Absolutely, and it just seems to obvious when you put it like that, doesn’t it? Because it’s not just the economic conditions, and it’s not just the situations that land on us. It’s also how we choose to show up in the world and respond to that, which is exceptionally powerful. I’ve noticed that you often say that you make positively practical. So what does that mean? Clare: Yeah, so it’s a great question. So for me, I’m not big on quotes and I’m not big on tips and things that can’t be used. Anything that’s one-way. Anything that I wanna share, I want it to be two-way, and I talk a lot about tools, so the slogan for my business is around simple tools for a happier life, and that’s because I want people to be able to pick up these habits, and tools, and tips and actually try them out and give them a go. I have always talked a lot about positivity in my business, so positive thinking, taking a more positive approach to things, because I do actually think that that’s really powerful. But like I mentioned before, the word positive brings up lots of different thoughts for people. It can bring up that Pollyanna image of someone that’s over the top positive but actually grinds people’s gears, or that it’s unrealistic, or people think about positive thinking as something that people put in place when they’re in their most dire situations, but if you replace the word positive at any time with helpful, then it takes on a whole new meaning, I believe. Instead of positive thinking, helpful thinking. What’s a more helpful way to think in this situation? Rather than what’s a more positive way to think in this situation? And I really believe that that makes a big difference. Kylie: So what are some of the reoccurring themes that you see in your coaching practice? Clare: Oh, so many themes with a coaching client. So I think we definitely over-complicate things out of fear. We can create more noise around what is actually the one single next step that we could take to move towards our goals, because it’s easier to do that and it helps us shy away from actually taking that step. I think that often we think that decisions are more permanent than they actually are, so people might be looking at two different alternatives. Both of them might be great, but they’re in that really indecisive time around, “I can’t make a decision and what am I letting go if I do choose one of these options?” Whereas often, we can change our minds in so many cases as well. So I see that happen a lot. I see that our unhelpful thoughts get in the way of action a lot as well, so people making a lot of excuses particularly around time. So thinking that they don’t have the time to pursue a certain goal at the moment, and time can sometimes just be another way of actually saying that they’re scared or they’re unsure around the first step. Time is often something that comes up. It’s actually the most common reason why my clients and tribe don’t take action. And also another thing that comes up is that sometimes people think that they’re taking a lot of action because they’re thinking about their goals a lot. So they’re focusing on a goal that they actually want to pursue, and they’re maybe bouncing around in their heads some alternatives, or some options, or they have some ideas around what they could do with it, but they’re not actually taking any concrete action. And that can be a really dangerous space to be because you can find yourself a year down the track, and in your mind you’ve been working on it, or thinking about it, or starting to progress it, but then if you actually had to put pen to paper around what you’d actually done, it might not actually amount to a lot. Clare: Yeah, I think you reframe it. I think you help people understand by saying that they don’t have time, how is that making them feel? And how are they showing up in the world, whereas if they were then able to see that there are little pockets of time, or ways that they can actually introduce things or even align goals as well, so for me, I’ve been able to, I guess, align goals really cleverly in my life because I have had a full-time corporate role, and I’ve been growing this business on the side with these small pockets of time, so how do you align interests where possible, align skills where possible, how do you really pick the actions that you can take that give you energy as well, so then that helps you find more time as well. Kylie: Yeah. So I noticed that on your website, you actually have the five excuses. The top five excuses for people that show up to … that often get in the way of people wanting to cultivate or being able to cultivate this. So you’ve got some fantastic resources on your website that people can turn to as well. One question that has come up for me during our discussion was we’ve talked a lot about thoughts and there’s the idea of, “Oh, we just think more positively and everything will work itself out.” In your experience of having negotiated some pretty tricky times, is it all just positive thinking or do you think that there are some other allied skills, or tools, or things that people could be doing if they find themselves in situations that are pretty tough? Clare: Yeah, I think positive thinking’s really helpful. That helpful thinking is helpful. The more positive emotion that we access, so whether it be happiness, or joy, or freedom, or success, the more likely we are to actually take action. So I think it is important to focus on actually accessing those emotions when you can. Kylie: Sometimes we find ourselves in positions where it’s very hard to actually even think positively. It’s even hard to think that I need to think positively, or that that could help, and the kind of body of work that’s out there that sort of says, “Just think more positively about the situation and things will work out.” But sometimes that’s not enough. Clare: Yeah, sometimes positive thinking isn’t enough. You need positive thinking and positive action, and where the positive thinking can help is it can actually help you access positive emotions, so emotions like joy and maybe success, or freedom or happiness. And those, when you’re experiencing those positive emotions, that can be more likely to drive you to take action. But yeah, one or the other isn’t enough, and negative emotions actually have a place as well, because they can be really great teachers for us. Experiencing stress, or anxiety or worry can actually be a red flag to us that something’s not quite right, and that we need to change something, and that we maybe need to take some action, and that can actually drive action as well. And a third thing is if you’re too positive all the time, and you’re thinking that it’ll just work out, that can sometimes trick us into not taking any action at all. So that positive mindset can actually be a little bit of an enemy or a bit of a hindrance, and stops us taking action. And I know for me personally, this was a case with my money mindset. I was very positive around that everything was always gonna work out, I’ve got highly skilled, highly employable, really great experience, no signs in the future of any shortage of work, and I would think that everything’s gonna work out. I’ve got a few assets that I’m chipping away at paying off, and the thing is that you actually need to pay attention to things. You can’t just necessarily be like it’s all gonna work out, and that leads you to a space of maybe denial or needing to pay attention and just making sure that things are actually on track when perhaps they might not be. Kylie: Yes. Yes. So if we find ourselves under an avalanche of negative thoughts, of that 65% of those 65,000 thoughts that we’re having a day that are negative, how do we start to move that? If we were in a work situation and we could feel some of those negative thoughts popping up, what’s some of the things that you would recommend that we could do? Clare: Yeah, so I would have a cheat sheet of more helpful thoughts. So I know if I’m working with a client last year who was in a pretty demanding workplace, she was often having thoughts around, “I don’t know where to start when I don’t know something.” Or, “I don’t know where to get help.” Or, “I don’t know how to do this.” Or, “Am I qualified enough for this?” Some really big questions started to come up, really creep in and affect her confidence, and so we got her to spend some time thinking around what are the common thoughts that were coming up, both helpful and unhelpful, and then to actually write in the back of her notebook that she had with her 24/7 around a cheat sheet of some helpful thoughts to go to. And our thinking is just another process, and so people that own their own businesses or work in a business will know how important processes are to streamline and speed things up, and I think that thinking processes are just as powerful in this case, and always as well. So in this case this client had this list of more helpful thoughts in the back of her notebook, and it was thoughts like, “When I don’t know where to start, these are the three actions that I know will help.” And it was around calling someone friendly to get the first answers or start to try and navigate through a network. Another thought was around, “I’ve learnt new things before.” Another thought was around, “I actually love learning new things and putting new knowledge into place, and this is another opportunity to do that.” And so were there this list of go-to helpful thoughts, that whenever she was feeling a bit anxious or she could feel her heart racing ahead of her, or she was going into a meeting with unknowns, where the outcome was unknown and the stakeholders were unknown, she could look back to the thoughts in that book and understand that she was really effective in meetings and she enjoyed connecting with people, and so they were those reminders when she absolutely needed them to support how she was working, how she was connecting, and the outcomes and the impact of her work. Kylie: So I’m a huge believer that things only get better when they get talked about, but it’s the conversation that we have with ourselves first and foremost that’s one of the most empowering, impactful conversation that we’re ever going to have throughout our whole life. So I love that tool. That’s such a simple idea of, “How do I have a conversation with these hard thoughts, and how do I talk about them in a much more helpful way?” And I love that idea of replacing positive, which as you said, can often conjure up that whole Pollyanna, unrealistic, not facing reality world, with helpful. You know, “Is it helpful for me to be thinking about this situation in this way rather than this way?” That’s a bit of a game-changer, I think, right there. Clare: Yeah, it sure is. Kylie: Yeah. So what do you think the cost of not being aware of how your mindset impacts your work and your life is? Clare: Oh, I think it’s everything. Your thoughts are the fuel for how your life is. It’s a little bit like baking a cake and putting salt in instead of sugar, and you might still get a cake at the end of the day, but it’s not gonna be as delicious and amazing as it could be. Another analogy is around putting fuel in your car, when you’re coming back to the fuel thing, and if you put in fuel that’s a bit damaged or isn’t really gonna prime your car to operate at its optimum, then if you’re putting in the wrong fuel, then it can actually … the engine might not run really well. Or it might actually do some damage. And then so your car might break altogether, or it might be operating in a really, really poor form, and not get you to where it needs to get you, and for you to be able to live the rest of your life. And negative thoughts actually leave traces in your brain, and positive thoughts actually create new neurons to fire, and it can actually change your brain as well. So I think the cost of not thinking helpfully is everything, and something that you and I have spoken about before is that movie, that throwback to the ’90s, that great movie Sliding Doors, where the lady, the main character, caught a train in one scene and didn’t catch a train in the other scene by a millisecond of difference, and how different her life could be, and I often think about time when I’m feeling like I need a little bit of courage. I think, “This is one of those Sliding Doors moments.” Is it really going to be helpful for me to maybe go up and introduce myself to somebody, or to send that email, or to chase that opportunity, or to say no to something that maybe I really wanna go to or that I’m planning on going to and spending some energy on because I’ve a fear of missing out, rather than because it’s actually gonna be the best thing for me as well. So yeah, I think it’s everything. Kylie: So we have that Sliding Door moment choice. You know, “How am I going to choose to show up in this situation? And how am I going to prime myself for the best positive outcome based on the values that I hold dearly?” Which is what you mentioned was the driving force for all of this way back when. Kylie: Yeah. So what three things would you like people to take away from our chat today? Clare: I think that helpful or positive thinking is a habit, and trying it once and it not working is a bit like picking up a tennis racket and being aced, and assuming that you’re not gonna be good at it or it’s not gonna work for you. It’s absolutely a habit, and it’s one that I really strongly believe is worth investing in. I think the second thing would be don’t over-complicate things. And apply lessons. Don’t just collect things. Make sure you’re applying them as well, and I know that we live busy lives. We’ve got lots of roles, we wear lots of hats, and we’ve got lots of messages coming to us all the time from so many different sources that it can be really easy for us to forget who we are, and to tune out of the smallest things that truly make us happiest. And that’s, I guess, where writing a top five is really powerful, because you’re getting a chance to tune into the things that have really lit you up during the day, and to be able to really collect data on what makes you happiest and brings the most positive emotions. And I think the third thing would be around questioning your thoughts that aren’t helpful and replacing them with something that is more helpful. It doesn’t have to be the most positive thought that you’ve ever had to replace a negative one, but just how can you make a tiny shift and replace an unhelpful thought with something that is a little bit more helpful, and like we’ve talked about, it’s game-changing. Kylie: Yeah. Fantastic. Have you got any tips on how to make a habit stick? Clare: I think paying attention to how you feel when you’re putting a habit in place is powerful, because if you’re actually … rather than trying to think too far ahead around what a habit might bring to your life, or to think too clinically, just be really tuned in day to day around how that new habit’s making you feel, and try and catch the wave and the contagiousness of those positive emotions. Kylie: Yes. I have sometimes heard of things … butting habits up against each other. So like when you brush your teeth, that’s also the time that you could potentially foster those five top things. Or you’ve got a habit of obviously getting into bed every night. If you had your journal and pencil next to your bed, or tucked in with your pyjamas or something like that, that it just became part of another habit. It’s sort of the linking of the two together when you’re trying to build a new one. Clare: Yeah, that’s a great point. Yeah. That habit stacking, and I know some people write their top fives on the train on the way to work, on their morning commute, and even though they’re not writing it at the end of the day, and I’ve found this myself, if you’re starting to tune into those positive moments from the day before, you see more that day as well, because you’re actually priming your brain in your morning. The other thing as well is that some people have tried and often write a top five with a partner, or a sister, or parents, or a friend, and have that kind of idea of the optimism buddy, which can be really powerful as well. The one watch out there, I would say, is make sure you’re writing your top fives for yourself, because if you’re writing your top fives for somebody else to read, or to share with someone else, then they might be influenced around the dynamics of that relationship, so I encourage people to definitely do that. Have someone that they share some of their top fives with. But don’t feel they need to share them all. Share one or two and keep the others. If you’re really honest with yourself around what has lit you up, then to, yeah, just make sure that you’re honouring that as well, for it to be as effective as it can be. Kylie: Yeah, so they’re absolutely for you in the first place, not necessarily for public consumption. And the other thing that I’ve heard about also in the gratitude practice is looking for unique things each day. And they’re, like you mentioned, they’re the smallest things. They don’t have to be the big things. But the small things. But unique ones, so you’re not always just putting a crutch under the same old things all the time. Clare: Yeah, that’s a really good point actually, Kylie, because for me, my gratitude lists, or my top five lists, aren’t around having a roof over my head and having a meal to eat. It’s moment-based, so it’s like a rolling journal. So it’s capturing those moments and experiences that have happened every day rather than, yeah, a same old list, which is definitely things that we should be appreciative of. Things like having a roof over your head and food to eat, of course, but yeah, for me the focus is around capturing those moments that are bringing that positive emotion or helpful emotion to our lives. Kylie: Yeah, and I just remembered, a couple of weeks ago I posted on Instagram that I had a really bad case of Mondayitis, so just was like, I was not feeling Monday, and I was actually feeling a bit blue and down in the dumps, and I knew that I had work to do, and I actually posted on Instagram saying, “I’m feeling a bit crap today. I’m having a bit of a Mondayitis, but these are three things that I know that are gonna happen today that I’m really looking forward to, and that I’m really grateful for.” And I can tell you that it moved the needle on how I felt on that day. It doesn’t mean that I was jumping around all smiles and laughter, but it meant that it definitely had an impact to saying, “I’m gonna be able to talk to this person today, and I loved her, and I wanted to be able to speak to her for months. So this is a great day, and I have to walk the dog today, and it means that I get out and do some exercise, and in some sunshine, and I’m grateful for that.” And it just moves the needle, so from someone who has actually, absolutely experienced this as well, I’m totally in your corner. Where can people find out more about you, Clare? Clare: Yeah, so over at topfivemovement.com. I’ve got the site which you mentioned before, so we’ve got over 100 tools there that people can use, get in and experiment with, and they’re sorted by the five most common excuses that hold us back. So we’ve done some research to discover what they are and then we’re sorted each resource by those excuses. And we’ve got also some more information over there on the top five. We’ve got a TEDx talk that I did five years ago around what the world would look like if everybody did the top five, so that’s a great way to introduce the top five tool to other people. We have teachers using that in classrooms and workplaces as well. And also we’ve got over there our award-winning happiness tool. Our positive thought starters, which you can read a little bit more about as well. And we’re also, thanks to your influence actually, Kylie, we’re being more active on Instagram as well, and sharing things like mindset hacks regularly, and customer stories around how they’ve been able to implement the top five, and what a difference it’s made. And yeah, as many tips and tools that we can possibly share, we are doing that as well. Kylie: And I love the positive thoughts starter cards, because we sit down when we have dinner each night with the kids, and we have the deck of the cards on the table, and we love pulling out the questions of, “What did you savour today? Was it a moment of stillness, a flower, or something that you ate, or what’s the first thing that made you smile or laugh today?” I’m pulling the cards out now and having a look at them. “What made you feel confident, proud, inspired or kind today?” These are the prompts that help you look for those unique moments, or if you’re having trouble thinking about, “Where do I actually start?” These cards are fantastic, and I’ve also done this at a team meeting as well, within my team, back in my corporate days. We would start our [inaudible 00:49:39] with these kind of prompts, so we were showing up in the way that actually built some more positivity in the team, and kind of setting some culture about how we wanted to be in the world, and the kind of things that we really fostered as being important within our team culture, so I can see so many applications for the cards. I just love them. Clare: Yeah, thank you. We’ve had a really great response. We’ve had teachers buying them, we’ve had parents finding them when Googling different and innovative ways to support their teenage children with anxiety, we’ve had … a beautiful woman contacted me the other day and said she bought the cards to give to her parents, and one of her parents was actually living out their last days, and he was unwell, and she gave the cards to her parents so that they could really reflect on the positive memories in their lives. And it’s the same thing. That’s a simple example, but when you apply that to the other questions that are in the deck around, well, “What’s one project that you enjoyed making progress on today?” Or, “Who’s somebody that you unexpectedly connected with today?” Or, “What one thing made you feel proud today?” And you can actually see that the application of that over a long period of time, and really training your brain to focus on that can have a big impact. Kylie: Yeah, it has a massive impact on ourselves and the conversations that we have in ourselves, and then the conversations that we foster around our boardroom tables, in our meeting rooms and around our dining tables. It’s so powerful, Clare. So I’m so grateful that I got to speak to you today. You’re definitely going on my top five for today. Clare: I think as well, I just wanna say, I guess, one caveat, if I can, around this, is that there’s still a place for critical thinking, and that that’s where some of our greatest innovations have come from, and some of the fantastic inventions is being able to put on those different hats. But when you’ve got that positive thinking habit, you are more likely to be able to be more creative, you’re able to problem solve more, you’re able to connect with people better, you’re able to recall information. The benefits are just incredible, and I heard Tony Robbins talking the other day about gratitude, and he said that, “It’s not a passing phase or some kind of nice personal development BS.” And that he actually used to think that he’d be more driven and effective when he was feeling really frustrated or mad about something, that that would drive him to actually come up with an answer. But he actually said that when he’s feeling grateful and he’s coming from that foundation of positive thinking, he’s more solutions-focused and he’s less defensive, and he’s more open to connecting with people. And he’s actually 10 times smarter when he’s in that mode. And I think that’s pretty exciting. Kylie: Well, that’s Shawn Achor research as well, going back to that positive psychology research. It’s what comes first. Is it success or is it happiness? And we often think that we will be more happier when we’re more successful, so we need to keep striving for that success in order to be happy. But the opposite is actually true, is that happier people, people who are able to have more useful, helpful thoughts in their life, who are able to develop more confidence through acknowledging some of these things that you’ve talked about, about replacing those unhelpful thoughts with more helpful thoughts, that is what actually breeds success. You gave a perfect example of that throughout our interview today, so. All more for having better quality conversations within our own heads, so that we can foster them in the communities that we find ourselves in as well. So thanks for your time today, Clare. What I’d love to do is just hang around for our 10 by 10. So are you ready for our 10 by 10? Clare: I’m a bit nervous, but I’m ready as well. Yeah. Clare: I know myself well and I’m not too ashamed to laugh at my own jokes. Clare: Hands down, every time, using the Pomodoro app. It’s amazing. Clare: Oh, so many songs. I walked down the aisle to this song, so I’m gonna say Here Comes The Sun by The Beatles. Clare: In a year’s time, what will you be glad that you started today? Clare: Write a top five list, of course. Or take out a Kiva loan as well. Kylie: A book that changed me. Clare: Over summer, I read a book called 10X by Grant Cardone, and he has been described as a crazy workaholic. He says this himself. But basically he takes away chance and luck for business owners, and he talks about massive amounts of action, and massive amounts of action basically lead to luck. So I would not recommend it if you’re wanting some downtime, but if you wanna be fired up, then I’d recommend that book for sure. Clare: We can have a lot of fun when we’re friends. Clare: A bath or exercise. Clare: I wanna change that stat around 45% of Australians likely to experience a mental health condition. I wanna disrupt people’s unhelpful thoughts. I wanna get our cards in the hands of a million Australians, and yeah, see what happens. Kylie: Thanks so much, Clare, it’s been a delight to talk to you today, and thank you for all that you do and put out into the world. We really have a lot to be grateful for your work. Clare: Oh, thank you so much for having me.